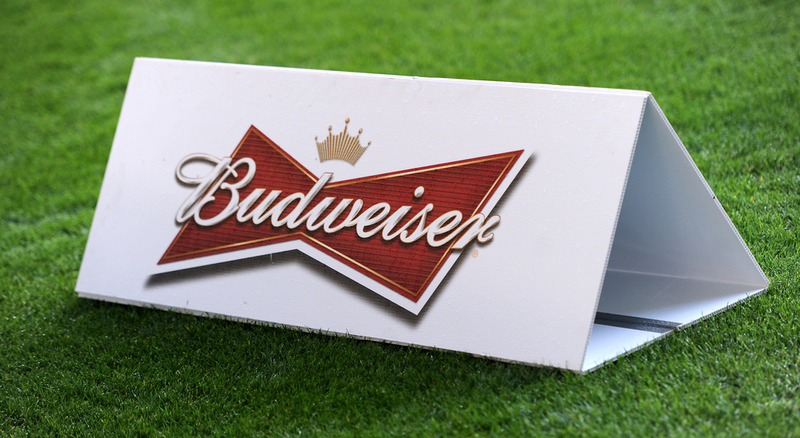 Budweiser have built a football pitch built entirely from recycled plastic cups, as part of their ongoing commitment to sustainability. The 'King of Beers' were the official sponsor for last summer's World Cup in Russia, dishing out a whopping 3.2 million plastic beer cups to thirsty fans throughout the duration of the tournament. After the competition had come to an end last July, Budweiser collected over 50,000 cups across 12 different venues, using them to create this fascinating arena. Cracking idea. The aptly named 'ReCup Arena', which is based in the Russian city of Sochi, measures 65 x 42 metres and will be used by local clubs to help encourage members of the community to get involved in football. Former Italy defender Marco Materazzi, who is now an ambassador for FIFA, was present at the Arena's opening event. The 'Word Cup RePlay' saw local Sochi residents participate in a match on the red and white pitch made from recycled plastic cups, the very first of its kind. "The 2018 FIFA World Cup in Russia has been recognised as the best FIFA World Cup ever. For a month, millions of tourists from all over the world were united by the real football celebration atmosphere," said Materazzi. "I am very glad that Budweiser, an official sponsor of the tournament, shares the idea of preserving the legacy of the World Cup and continues to build it up even after the tournament." Konstantin Tamirov, marketing director of Budweiser's parent company Anheuser-Busch InBev, added: “The FIFA World Cup is a celebration for millions of fans not only in Russia, but around the world. "Throughout the tournament, Budweiser surprised fans with its activations, gave them euphoric emotions, so we decided to create a unique facility – Budweiser ReCup Arena – specifically to extend this experience. Budweiser recently stated that by the year 2025, every bottle of beer they brew will be powered by renewable electricity. 100% Renewable Electricity symbols are also being added to Budweiser bottles in the US and UK markets, after the company recently achieved that goal. Hopefully this movement by Budweiser, who this season replaced Carling as the Premier League's 'official beer', will pave the way for more companies to start using discarded plastic in a more positive way. In addition, FIFA have also donated proceeds of the 2018 World Cup to over 400 amateur football clubs. Top work from all involved.